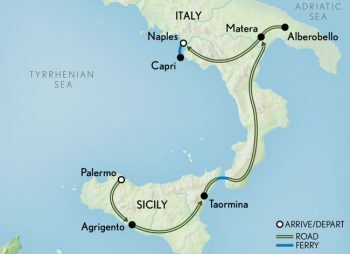 ​Discover the glories of Southern Italy on a panoramic journey that includes Sicily's ancient ruins and exotic landscapes, the remote towns of Calabria and Puglia, and the breathtaking Isle of Capri on the sparkling Amalfi Coast. Sicily has a long history of stubborn independence from the political forces of mainland Italy, and today remains an autonomous region with its own distinct history and culture. Arrive in Palermo, Sicily’s lively capital, and transfer to your hotel located in the city’s historic centre. Join your Resident Tour Director tonight for a welcome dinner. This morning, set off on a guided tour of ancient Palermo, including the Cathedral and the ninth century Norman Royal Palace with its glittering, mosaic-laden chapel. Still in use today as the headquarters of Sicily’s Parliament, the palace is the oldest royal residence in all of Europe. Continue to the hillside town of Monreale and enter its extravagant cathedral, a UNESCO World Heritage Site. Dating from 1170, it is perhaps the finest surviving example of Norman architecture anywhere in the world, and its mosaic-lined walls, said to incorporate nearly 2.5 tons of gold, are breathtaking to behold. Return to Palermo and spend the rest of your day at leisure exploring more of this unique port city. Journey east to Piazza Armerina, a graceful countryside town, where you visit the incomparable Villa Romana del Casale. A luxurious example of an ancient Italian villa, this UNESCO World Heritage Site houses breathtaking mosaics originally laid in the fourth century. Continue to the east coast of Sicily and up to the 6,000-foot-plus heights of smouldering Mount Etna, taking in panoramic views of the landscape and coast. Later, arrive in charming Taormina, which has allured visitors since the 19th century with its sweeping beaches and rolling hillsides. Today, a local expert introduces you to the town’s spectacular Greek amphitheatre, set high above the ocean. Still in use as an arts venue today, its permanent “show” is its extraordinary view of Mount Etna, rising in the far distance beyond the stage. Later, relax or catch up on shopping with time at leisure.